I’d been to Glasgow several times for work, but just to the data center, I hadn’t really had a chance to look around the town, so I decided it was worth making a visit. Only Â£6.50 return with megabus, pretty outstanding really. Glasgow was not really what I expected – I was expecting a much grimmer place, but it was actually really nice – I was even struggling to find large numbers of neds. I did notice a disturbing number of people obsessed with wearing their Celtic shirt to all social occasions though. My particular favourite was the man who was too hot to wear a shirt (another disturbing British tradition, that of taking your shirt off at the first sign of sun), but stil had his Celtic shirt over his shoulder, just so you would know who he supported. Overall a nice place, and I met some interesting people, who I’ll probably run into again a few more times. Blair was travelling through Scotland, and stopped in here for a couple of nights. We went up to the Orkneys for a day trip, which meant a pretty long day, but it was well worth the admission. There’s something not quite right about an island that only has about 7 trees on it, and none of those over 5m. We were very lucky with the weather though, and it was really quite a nice day. There are a huge number of prehistoric (or perhaps neolithic is a better term) monuments on the island, not least of which was Skara Brae – a cluster of dwellings inhabited 5,000 years ago, then covered up until about 150 years ago. You have to figure the climate was different then though, I’m not sure I would have settled there. The other travelling so far has been some touring around St Andrews – nice town, ruined cathedral, castle, golf courses, lovely houses, students spewing in the gutter, it’s got it all – and the Angus region. I went up to Dunnottar castle, which was great – really dramatic, must be pretty mean there during a big storm. Places like the Whig Vault were a bit spooky – must have been terrible with 160 people imprisoned in there. Bruce and Tanika stayed with me for a few days, which was great – really good to catch up with them. We had a good day out with Paul and Kate in Edinburgh. 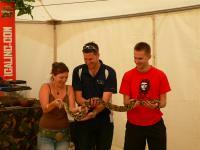 Just the one photo here, of us holding a snake. Good to have done, but I don’t think I’ll get one as a pet. Huge strength, very quick moving. A week later, I hired a car and headed north. Some fantastic driving around here, the scenery really is amazing. Went up to Culloden Moor, which was interesting, but didn’t really grab me. Maybe you have to be a Scot. 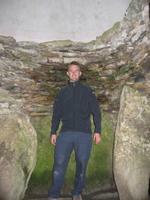 I found the nearby Clava Cairns more interesting, without the tourists. 4000 year old burial cairns, nestled amongst the trees, make you think a bit about the people who were once here. You just don’t get that sort of thing in NZ. 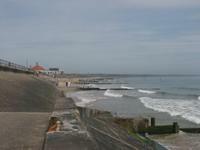 Further north after that, to the town of Wick. It’s just a small town, near the north of Scotland. Ended up having a great night out, amazing the interesting people you meet, even in places you might not expect it. Pushed on to John O’Groats the next day. Not that exciting, but one of those things you have to do. 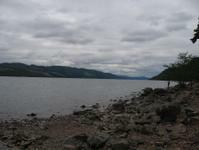 Came back via the Inverness -> Fort William road, travelling alongside Loch Ness. Can you see Nessie? No, neither could I. Coming back through the Glencoe region was awesome, huge rugged country, no trees, just some scrub and tussock. 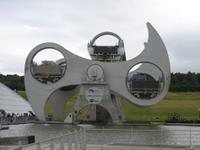 Dundee is pretty centrally located in Scotland, with much of the country relatively nearby. Since getting cheap flights to Europe isn’t an option from here, I’ve been taking advantage of the location, and touring as much of Scotland as I can. Hiring a car is reasonably priced, especially if you don’t really care much about what car you drive – e.g. last time I ended up with a Nissan Micra. If you’re feeling charitable, you would describe it as a scooter – fun to ride, but you wouldn’t want your mates to see you on one. Doesn’t look all that bad right? Could almost swim there? Well, on the edge of the horizon, you can see oil rigs, where men walk around in survival suits. All people going over on helicopters must be dressed in survival suits, and even then they’d be lucky to survive 5 minutes in the water…meanwhile back here in Aberdeen mothers are pushing their kids into the water. Scary. Next weekend trip was to Stirling, Falkirk and Linlithgow, followed by a morning in Fife, and watching the last afternoon of the British Open at the Old Course. Stirling was pretty cool, if packed with bored American students. The approach to the castle is just fabulous – it really dominates the surrounding plain. Something I hadn’t realised was that the castle used to all be a golden colour – it was clad with King’s Gold. Currently only the Great Hall is, but it must have been quite something with the whole castle that colour. Getting to Falkirk was a bit more..interesting…than it should have been – I was following the signs to the Falkirk Wheel, but then they just seemed to stop. I ended up going around a few times, and until I finally saw the smaller, different coloured sign, that pointed the way down the last road to the Falkirk Wheel. It’s really quite cool, and it’s made me really want to hire a canal boat for a week, just cruising along between pubs at 4 knots. I don’t understand how the whole EU/millennium funding works, but who cares, it was pretty good. 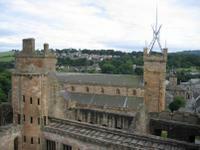 Linlithgow castle was very interesting – it’s ruins, but relatively complete, as far as ruins go. Unlike some other places, you get pretty free reign, and you can go pretty much anywhere. Not really sure what they were doing with that weird thing on top of the church next to the castle though. On the way back, I went via the Forth Bridge – I really don’t understand why all the fuss is made over the rail bridge – personally I quite like the road bridge. Visited Scotland’s Secret Bunker on the Sunday morning. Really quite interesting – makes you wonder what else is around that we don’t know about. Suprisingly few people seemed to know about it though. On to the golf at St Andrews – huge crowds, all pretty exciting. Not cheap to get in, but I figure I’ll probably never have the same chance to go to a golf major again. The course was weird – it was basically a paddock, with some mown strips. It would take me about a week to get around if I was playing I reckon. Good to see Michael Campbell playing, with huge numbers of Kiwis following him, all dressed in Kia Kaha shirts. 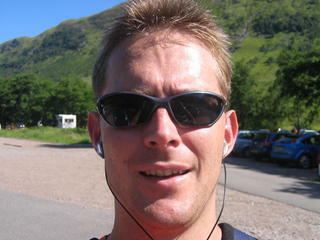 I’ll start uploading more photos and trip details shortly, but for now, here’s a picture of me after climbing Ben Nevis. It’s somewhat odd that I can go from nearly sea level to the highest point in this whole country in about 2.5 hours. It wasn’t much of a walk, but it was good to do. I was lucky to get good weather – misty in the valley, then clear from about a third of the way up. It was actually quite warm and sunny. I was reasonably well-prepared, but perhaps not as much as I could have been. I was suprised at the people who were doing the climb in jeans and t-shirts. If the weather had changed, some people would have been in serious trouble. You can see why more people die there every year than Everest – it’s not that it’s difficult, it’s just that people don’t treat it with the respect it deserves. 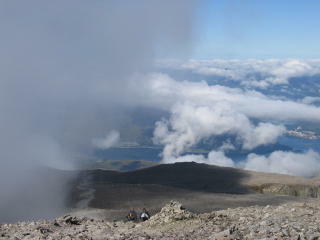 Look at the second photo, taken from the top – notice how the cloud is quickly moving in? The weather can change quickly here. The trail was pretty hard to follow in the top section. 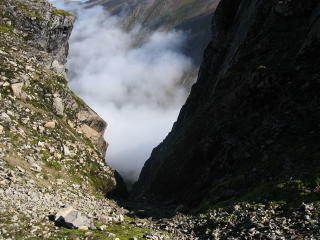 That last photo is taken quite close to the summit – that drop is only a few feet from the trail. Would be interesting in thick fog. It’s good to have done it, now maybe I can go and do some of the nice hill walks around here.